Three larger than life bronze figures, two men and one woman, dressed in the style of the early nineteenth century. One man wears a hat and the other holds his hat in his left hand. The woman wears a long dress and carries a large bag that has the word "STRIKE" on it. The statues are place on free-form shape suspended just over the pool which is sunk below ground. Water cascades down the sides and lights are visible beneath the water. A wide rim surrounds the monument which is set in a circle with seating around the edge. The Gillett pedestrian bridge is seen in the background beyond the symbolic Indian Mounds of Ah-Nab-Awen Centennial Park. The back of Devos Center is in the distance. Title by cataloger. 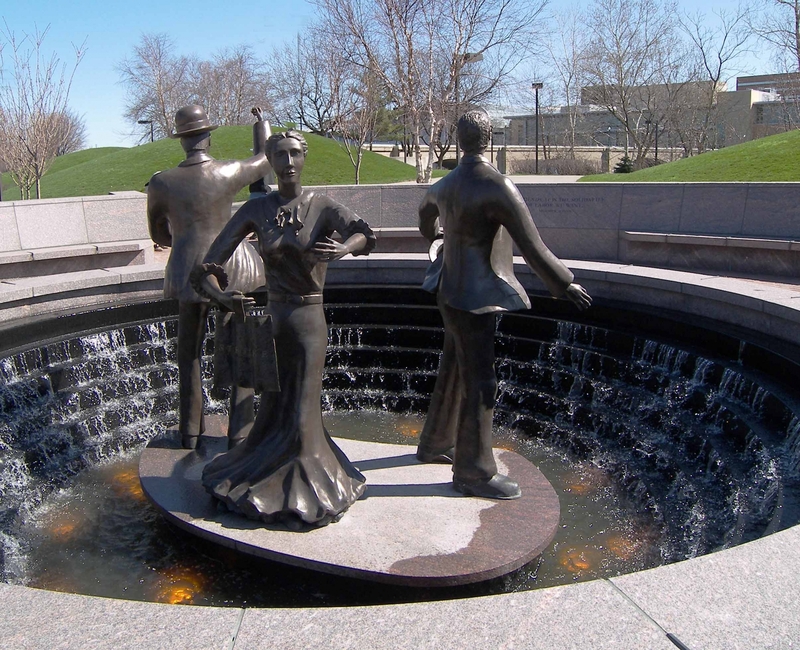 The dedication of the monument to organized labor took place April 19, 2007 on the 96th anniversary of the 1911 Furniture Strike in Grand Rapids. It is located on Pearl St. at the entrancd to the Ford Museum. The figures were carved and cast by Roberto Chenlo. The project was the work of the Labor Heritage Society of West Michigan.